« Should the true Christian church have Cardinals? Many people have questions about the Bible in general and the first several chapters of the Book of Genesis in particular. The first six chapters of Genesis present a sum­mary of vital high points of approximately the first 1600-1700 years of mankind — from Adam’s creation to just before Noah’s Flood (details on calculations can be found in the article Does God Have a 6,000 Year Plan? What Year Does the 6,000 Years End?). We in the Continuing Church of God have looked at various questions that were taken from authentic letters emanating from Ambassador College sponsored programs and publications or received as emails by us. 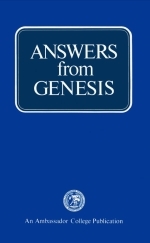 This particular set of questions and answer is an update strongly based upon those in the 1973 booklet (shown above) written by the late John Ross Schroeder, but with most answers partially updated by Dr. Bob Thiel in 2014. Biblical quotes are from the KJV unless otherwise noted. As human beings we usually view things purely from a physical basis alone. We think of everything as having an origin. And on a strictly physical basis — that’s true. However, God Almighty is Spirit (John 4:24). And a spirit being is not bound by laws of time and space. All physical things have a beginning and an end, but spiritual things are eternal (2 Corinthians 4:18). God Almighty inhabits eternity (Isaiah 57:15). He had no origin. He was “without father, without mother, with­ out descent, having neither beginning of days, nor end of life …” (Hebrews 7:3). The very Hebrew name for “Lord” in the Old Testament — YHWH — means “Eternal” or the God that has always, and will always, exist. These concepts are explained in greater detail in our free article: Where Did God Come From? Additional questions and answers are in the article: Questions and Answers from Genesis. This entry was posted on Tuesday, May 24th, 2016 at 12:01 am	and is filed under Old Testament History.